The Australian Government has targeted the use of Managed Investment Trusts (MITs) by foreign investors in a reversal of original policy objectives to the introduction of MITs, while couching the proposed package in terms of levelling the playing field. Unhelpfully and reflective of the muddle that is the Government’s approach to tax, despite the package being titled “Stapled Structures – Details of Integrity Package”, the package is neither limited to stapled structures nor detailed. There is a significant level of important detail missing, including how the package will practically apply and how domestic investors will be protected. Foreign investors in MITs. MITs are widely used in real estate, venture capital and private equity investments to attract foreign investors with a definite Australian tax outcome that was more generous than the Australian corporate tax rate (and the highest marginal tax rate for non-corporate investors) – an explicitly stated policy objective of the original MIT rules. Foreign pension funds and sovereign wealth funds. These are significant sources of funds, with Canadian pension funds being some of the largest sectorial investors in Australian infrastructure, from roads to airports to energy assets (including renewable energy). Investors (domestic or otherwise) in a cascade of trusts. A cascade of non-wholly owned trusts could arise in a number of non-tax driven circumstances, but there is no consideration of the purpose, just the outcome. Investors (domestic or otherwise) in MITs that invest in agricultural assets. The lack of detail and consistency in the description of the changes makes it difficult to assess exactly who the measures will apply to. 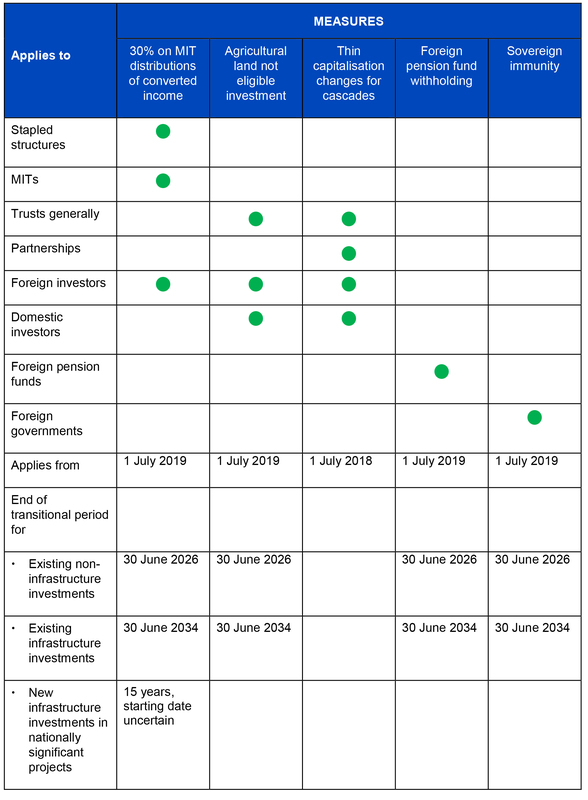 Investors with any interest in a trust and foreign pension funds and sovereign wealth funds must keep a keen eye out for more details, some of which may well come in the upcoming Federal Budget. What seems to be clear, though, is that traditional real estate trusts with stapled structures and no (or immaterial) cross charges are unaffected. In as much detail as we can glean from what Government has released, there are five elements to the proposed package, together with transitional rules, some of which apply to investments existing when the changes become effective and others which apply to investments that come into existence after the changes become effective. 1. Foreign investors in stapled MITs will have tax withheld at 30% (rather than 15%) for “converted” income. A mischief in any stapled structure, not just one that has a MIT in it, is that the trust side of the structure (which, generally, is not subject to tax) can cross-charge expenses to the corporate side of the structure so that the corporate side of the structure pays less (or no) income tax. a distribution from a trading trust (but, interestingly, no mention of a company). Where the converted income is an unspecified small proportion (presumably, 5% or thereabouts) of the gross income of the MIT, the 30% rate will not apply. Foreign investors in nationally significant infrastructure projects will be given a 15 year exemption from the 30% rate. However, at the end of the exemption period, the 30% rate will apply. How projects will be determined to be nationally significant has not been specified, but one would assume some form of approval process will need to be adopted. Further consultation is expected. 2. Agricultural land will no longer be an eligible investment business. Foreign investors (through MITs) enjoy a competitive advantage over domestic investors in agricultural land, specifically where that land is used to derive rent (as opposed to operate a farm or orchard). This measure prevents rent from agricultural land qualifying as “eligible investment business” income. The concept of eligible investment business is vital to the classification of all trusts, not just MITs. If a trust is not wholly carrying on an eligible investment business, it is a trading trust and can be taxed as a company (among other things). If changes are implemented to the “eligible investment business” definition (as announced) rather than the MIT rules, they will affect all investors, domestic and foreign, in a trust. It will convert the trust distributions into franked dividends in the hands of all investors provided all of the conditions for franking are met. Foreign investors will not pay any withholding tax on the distributions, while Australian investors may pay top up tax or get a refund of excess franking credits (assuming there are no changes to the franking credit rules). 3. The thin capitalisation associate entity test will be lowered from 50% or more to 10% or more. This measure is designed to prevent the multiple gearing of transparent entity structures (that is, those with trusts and partnerships). It is possible to gear cascaded trusts and partnerships at each tier where, broadly, each tier does not control 50% or more of other parts of the tier. Under the measure, the relationship threshold will be lowered to just 10% or more. There is also a consequential change to the arm’s length test, requiring testing against the ultimate underlying property. At 10%, it is almost impossible to compel the underlying entity to provide an investor with the financial and tax information necessary to be able to undertake thin capitalisation calculations properly, meaning there is either no gearing at the interposed entities or, more likely, the thin capitalisation rules are applied conservatively with greater interest deductions denied than would otherwise have been the case. This measure will operate with regard to the purpose behind the cascading of transparent entities, which means investors with legitimate reasons for the cascaded trusts and partnerships will suffer. 4. Foreign pension funds with non-portfolio investments will be subject to withholding tax. Foreign pension funds, whether government or private, that are exempt from tax in their home jurisdiction are also currently exempt from Australian interest and dividend withholding tax. Foreign pension funds, together with Australian superannuation funds, are significant sources of funds for Australian infrastructure projects across a diverse range of industries. This measure will allow the exemption only for foreign pension funds with portfolio-like interests (less than 10% ownership interest and no influence over the entity’s decision making). Both of these limbs eliminate many direct investments by foreign pension funds and the second limb on influence can also have a significant impact on some foreign pension fund investments. Foreign pension funds can continue investing through MITs and obtain the 15% rate. However, with the converted income measure, investment in infrastructure assets through MITs may become more difficult given the significant land component of some projects. It is unclear how the exemption from interest withholding tax will interact with the portfolio-like test. If a foreign pension fund was to only lend money (even where it is able to exercise influence in other ways), it will presumably be able to obtain the exemption, opening up planning opportunities. 5. Sovereign investors with non-portfolio investments will be subject to withholding tax. There has traditionally been an internationally recognised principle of sovereign immunity that prevents one sovereign taxing another (kind of like the business world’s version of diplomatic immunity). The immunity is applied to passive and minority investments, but has never been legislated. This measure will create a legislative framework for the sovereign immunity exemption and limit the exemption from taxes to foreign government investors with portfolio-like interests (again, with no influence). The exemption will not apply to distributions of active business income, including distributions through trusts and converted income. All elements (except the thin capitalisation measures) will commence on 1 July 2019. A transitional period of 7 years for stapled structures and 15 years for infrastructure assets will apply for investments in existence on 27 March 2018. The thin capitalisation element will apply to income years on or after 1 July 2018 (with no transitional period). The problem with any transitional period, including the one for nationally significant projects, is that investors will look to exit the investment prior to the end of the transitional period. So astute investors may find bargains in about 7 years’ time! There was expectation that the stapled trust measures, when announced, would also legislate on the control issues that plague the funds management industry, including in private equity and venture capital. That hope has been dashed, with no mention of control issues. This leaves the private equity and venture capital industries taking positions on Tax Office guidance that is, in many respects, controversial and not consistent with global industry practices. But that says more about our archaic trust tax laws (yet another lost opportunity for Government) than it does about the Tax Office’s interpretation of those laws. There are a vast array of non-MIT stapled structures used in the Australian landscape which achieve tax effective outcomes, as alluded to previously. It is interesting that the Government has not targeted these structures, but perhaps this will come in time. The good thing about the proposed package is that there are transitional provisions for most of the measures, meaning a restructure is unnecessary. And the transitional periods run from the effective date of the measures, rather than from the date of announcement. Fund managers with a stapled structure already in place should have 7 years (or 15 years for an infrastructure fund) under the transitional rules and do not need to take active steps to change the structures. Many funds will cease within these transitional periods. Those that remain in existence beyond those periods may simply choose to bear the additional tax for particular income and particular classes of investors. However, new funds should consider their use of MITs and stapled structures. MITs will still likely be the fund vehicle of choice, as funds should generally not be worse off than other vehicle choices. However, the new law will limit the tax benefits of forming a stapled vehicle for the pure sake of tax – a policy win for the Government. Managers should also review their investor list and check whether any pension or sovereign funds will be affected. Muhunthan leads Gilbert + Tobin’s tax practice, which has been ranked by Legal 500. He has extensive experience advising clients on manage their tax exposures from transactional activity in a broad range of industries and in tax disputes with revenue authorities. He is actively involved in industry consultation with Treasury and the Australian Taxation Office. Gilbert + Tobin is a leading independent corporate law firm, providing innovative, relevant and commercial legal solutions to major corporate and government clients across Australia and internationally, particularly in the Asia-Pacific region. Gilbert + Tobin has become the legal adviser of choice for industry leaders who value our entrepreneurial culture and determination to succeed across a broad range of areas including: banking and infrastructure; corporate advisory – funds, mergers and acquisitions, private equity, capital markets, tax and stamp duty; communications and technology; competition and regulation; energy and resources; intellectual property; media; litigation and dispute resolution; and real estate and projects. For more information, please visit www.gtlaw.com.au.